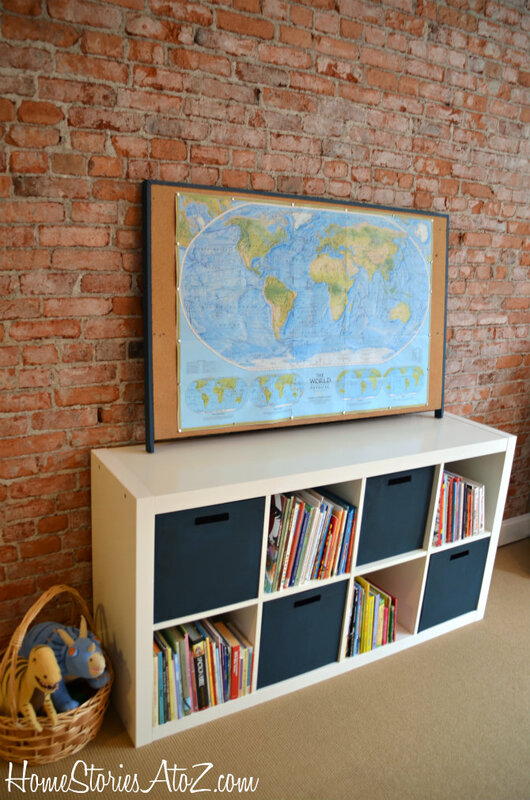 I have been so busy showing my boys’ bedroom project-by-project that I forgot to show you the entire space! Let’s tour the room in its entirety, shall we? In the picture below, you can see how it looked in 2009 when I revealed the Raingutter Bookshelves with Beadboard Wallpaper and how it looks today. Aw, look at how my babies have grown in the last three years! In case you’re inspired by the transformation, I’ve included a source list at the end of the post for your convenience. 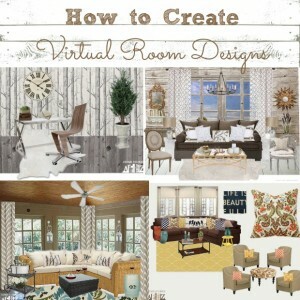 I’ve also included links to all of the tutorials for the many do-it-yourself projects that went into the making of this room. Enjoy! 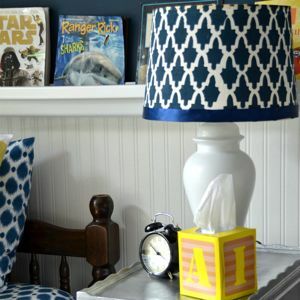 Lamp: Thrift store lamp & shade stenciled with Royal Design Studio Stencils. Nightstand: Curb find. Spray painted in Krylon Chrome. I love your boys room.. It has inspired me! Looking forward to redoing my sons room. Can you please tell me what kind of carpeting you have in this room. Where is it from style and color. Thank you so much! Thank you! We installed the carpet 8 years ago when we flipped our home and I can’t remember the brand or style. I know that Shaw has a similar looking one. This bedroom is adorable!!!! Where did you get those bed sets?? I love their bed! Can you tell me where the twin bed are from? Thank you! They were purchased a decade ago off of ebay and they are bunk beds. I just have them unbunked now. Where did you find the beds? I found them nearly a decade ago on ebay. They are bunk beds that are just un-bunked at the moment. I was wondering how the bead board wallpaper was holding up after the years? It’s held up beautifully. I wouldn’t put it in a high traffic area where it would be nicked but I have it in my half-bath and boys’ bedroom with no problems. Love love love this room! 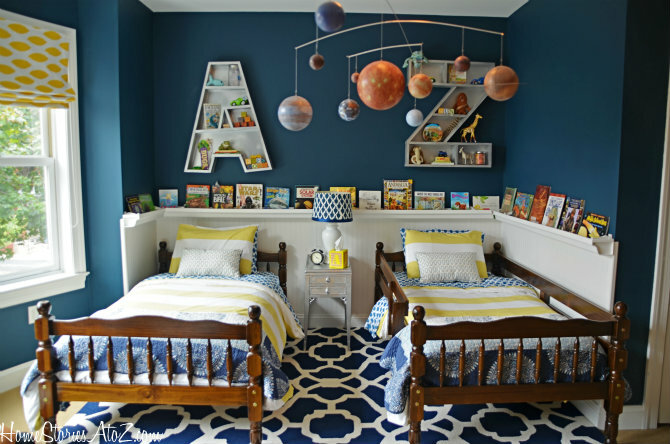 What a fabulous room for two little boys. I must ask how the rug is holding up? Is it soft? Is the white part raised? I’m thinking about purchasing for my little ones playroom but a little hesitant. Thank you!! Is that seagrass wall to wall carpeting in their room. I love it’s look and low profile but fear its rough texture for a children’s space. In a smaller room with a nice area rug, maybe its a non-issue. Hi Meg, It’s a carpet that mimics a sisal look put it’s not actually sisal. It feels just as soft as a tight berber feels. I love this room! I have been looking all over for a twin size bed that my three and a half year old son can use into his teens, where did you get yours if you don’t mind me asking? Hi Kristi, I bought the bunk beds off of ebay about 7 years ago. I’ve seen some similar ones on there though so look around. Good luck! I love both versions of the room. My son is 3 and wild about Dinosaurs and I was wondering where you bought the dinosaur bed spread from the 2009 room. Or maybe if you remember the brand because I am sure I would have to look online. Love the new room. Thanks for sharing the name of the color, too. I’m going for a combination of the old/new room colors. Do you mind sharing what the name of the tan, too? Thanks! Thanks Maureen. The tan is Benjamin Moore’s Sherwood Tan. Beautiful job! Years ago (10 to be exact), I was trying for this exact same shade in my son’s room. Except it went just a tinge of turquoise bright. Sort of your blue but brighter. I never liked it. You got it exactly right. I straightened out my son’s room by painting it white during a remodel earlier this year. He preferred the blue but was ultimately indifferent (he is 14 and indifferent to most of what I do now adays). Wow! Great job, Beth. I love that you kept the beds the same. I still have the 2 beds from my husband’s childhood room. One was painted white for my daughter over the years. I dream of using them for a someday guest room. So cozy– enjoy your boys every minute! Julia (hookedonhouses) led me here. Thanks for sharing. I read some of the negative comments on the other blog that featured you, and I completely disagree! I think you made a wonderful room for your boys. So many of the “designer” kids bedrooms look like an adult room with a smaller bed, and many other kid bedrooms are over themed or look like the kids wll outgrow it in a week (like my oops of painting trains on my boys walls, they don’t care for Thomas any more!) I love the rain gutter shelves, I’ve never seen them used like that before, and it’s a wonderful idea. The letter shelving, the colors, the fun but not crazy patterns, love it all! 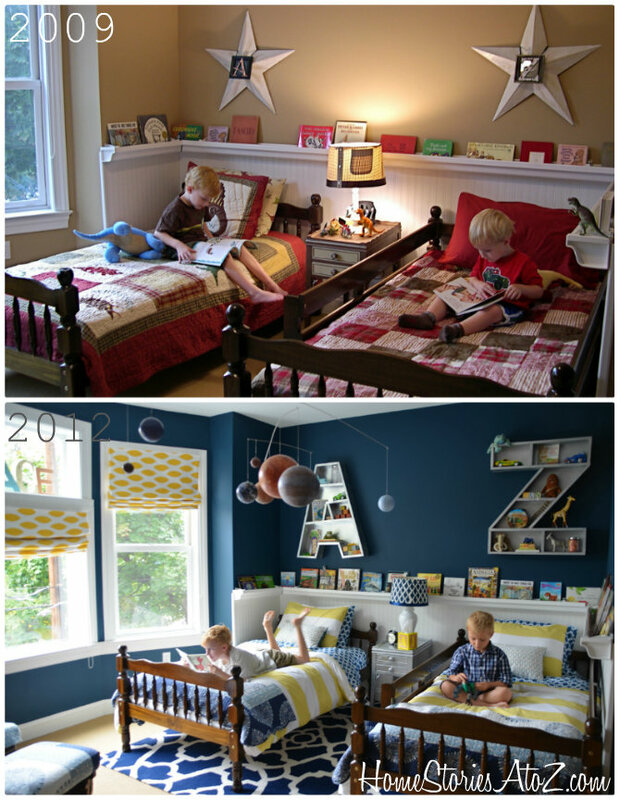 Who knew a simple before and after pic of my boys’ room could cause such heated words, eh? Thanks for taking the time to stop by and leave me a comment of encouragement. My boys love their new bedroom and it was a labor of love for them. 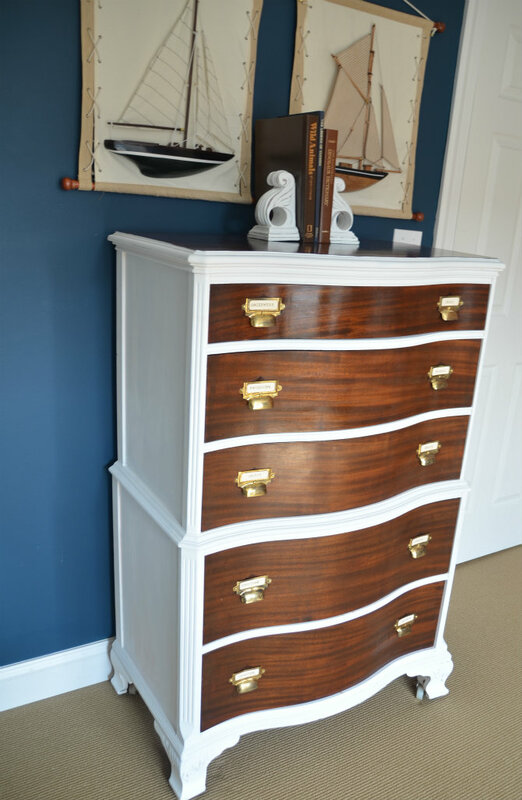 I love the dresser drawer pulls very smart idea! My daughter now wants a book rail around her room too. Hello Beth, I am very glad I came over here after seeing Hooked on Houses. I see many more fun elements of this room, and a lot more of the architectural and design sophistication that went into it. I really love the texture and history of the exposed brick wall. When I was a kid, a wall like that would have unleashed gales of imagination. Oh, wow. I liked the room before, but the after made me nearly fall off my chair. It’s wonderful! Makes me want to give my son’s room a makeover now. Love that wall color. Thanks for the inspiration! Just want to say thanks, great idea for the book shelf along the wall. where did you get those beds? LOVE them! Thanks Erin! The beds are actually “de-bunked” bunk beds that I bought online from ebay 5 years ago. Girl – you knocked it out of the park! The bookshelf letters and the furniture makeovers are my favorite parts – but the whole room is just perfect – fun, youthful – with lots of room to grow. Also, where are your beds from? Thanks! I bought the beds several years ago on ebay by searching walnut bunk beds. They are actually bunks that just aren’t stacked right now. They are solid wood but were very inexpensive—less than $250. I am in the process of doing a shared room for my 2 sons. I love this! Thanks for the inspiration. Those shelves are so cool! I know you are amazing and where able to make them. Do you know anyone or anywhere where I could buy something like these? Hi Rachel, the shelves are made out of raingutters. I don’t know anyone who sells shelves like this, but I’m sure you could hire a carpenter to construct them for you. Although that would be a shame because they seriously cost like $20 total! This room is beyond awesome. What an great place for those boys to grow up! The room looks wonderful, Beth ! I love the blues you used and the boats ! 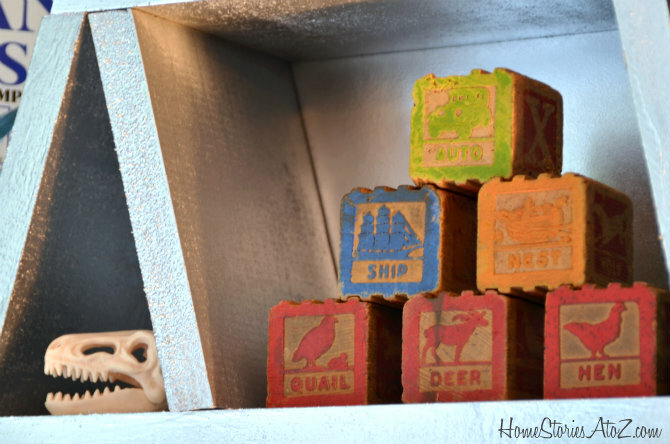 (the blocks look familiar 🙂 I’m sure its a place of adventure within and without ! That looks incredible! I think the letter bookshelves are my favorite! This is absolutely Fabulous! I am loving the colors and well….just everything. 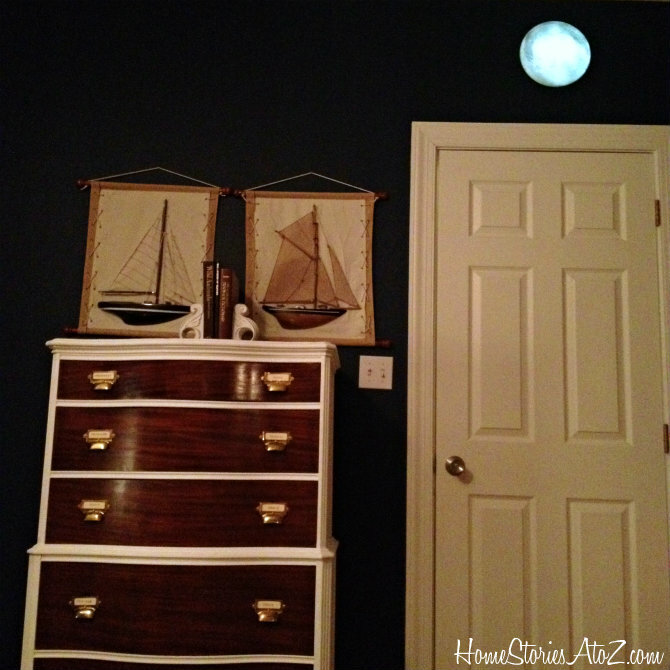 I could use your skills for my boy rooms…..Thanks so much for sharing! Thanks Mindi! I think boys rooms are especially challenging to decorate. So many fun details! You did such a wonderful job on everything, Beth. I bet your boys are loving it. They DO love it which is such a thrill for me :). Beth, I think this is one of the most perfect boys bedroom I have ever seen. The blues and yellows are so warm yet lively. There is nothing about this room that I don’t love! I also can’t get over how big the boys are! Those ate some lucky little guys to have a mommy like you! What a wonderful space for your boys! I have three and they are in need of a makeover for their rooms. thanks for the inspiration! 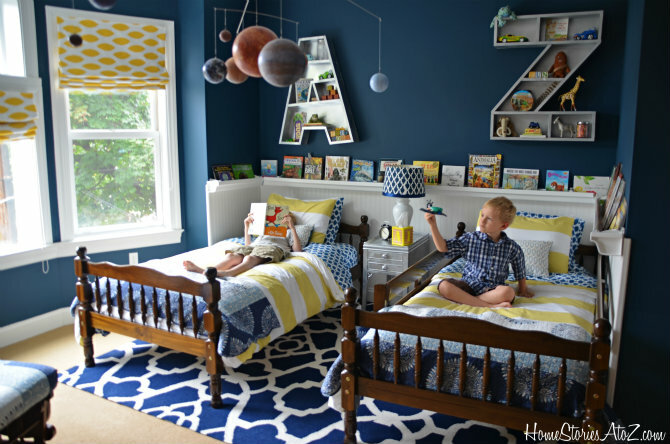 Oh wow, three boys’ rooms to decorate would be a challenge! Thanks so much for stopping by Kristin! what a gorgeous room!btw,the boys are cute! Thank you Mandy! I think so too :). Beth, The room is simply stunning! The patterns and colors are so fun and classy. I have two boys myself and truly appreciate the inspiration. Well designed boys rooms are rare. Yours is one of my favorite of all time! What sweet words to leave me Jackie! Thank you! And I agree, well decorated boys’ rooms seem few and far between. Although, I must say that they are definitely on the rise. I’ve seen so many inspiring ones this year! Standing ovation from me to you! Well done Beth, well done! It really came together beautifully and you obviously put so much into it! oh my gosh, i didn’t know you made those bookshelves. they look great! They were challenging to create, but I’m glad I took the risk and made them. They definitely make the room for me! Oh. My. Word. This is just beautiful. I love the colors you picked up. It is masculine yet fresh and fun. Fantastic job! 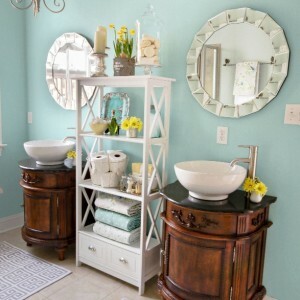 Love this room Beth! We have such similar tastes, seriously. So many of the things in this room are things I’ve considered doing…but I especially love the dressers and the A and Z shelves. I have the corbel bookends in my house haha! We even used the same font for our watermark. Great minds think alike! Great minds indeed think alike :)! So funny! 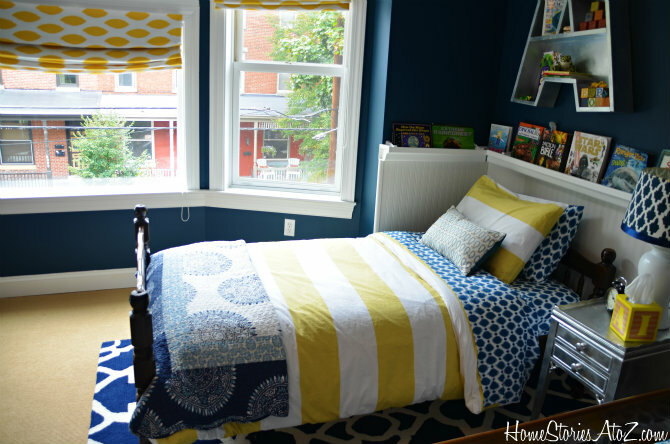 Such a fun and cheery space for boys! 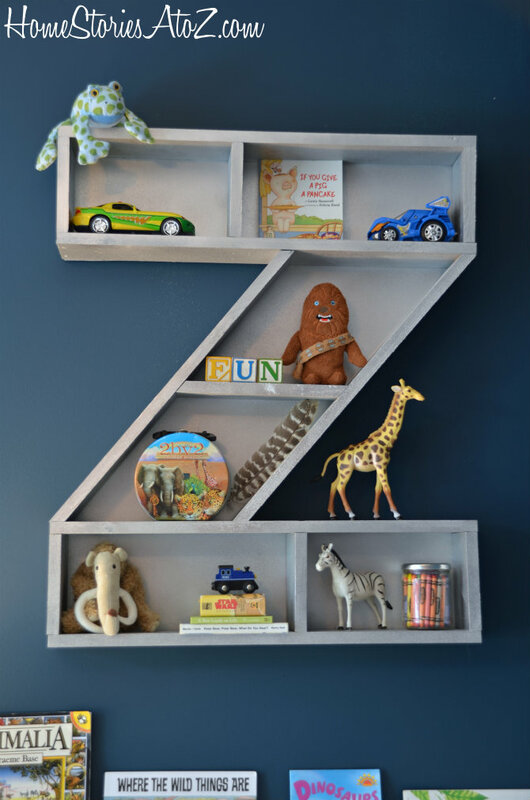 The letter shelves are adorable. Great Job! 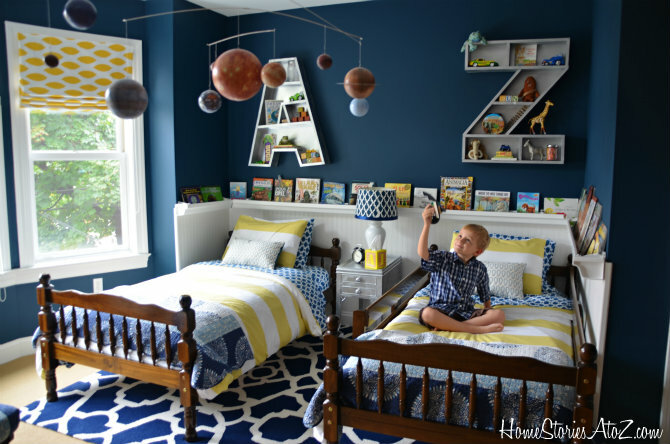 This is the cutest boys’ room I have ever seen! Great job with all the details. I love the shelf around the room too. Love how this turned out! You did a really good job. The color palette and the old wold charm work well together. So fantastic! I love the color palette and all of the great details! The wall shelf around the room is Amazing!!! Way fun just like two little boys should have, and the dressers – yeah I love, LOVE those. Awesome transformation! You’ve done such a marvelous job incorporating all the things your boys wanted and keeping it classy at the same time. Wow! You did a great job!! You are clearly very talented. 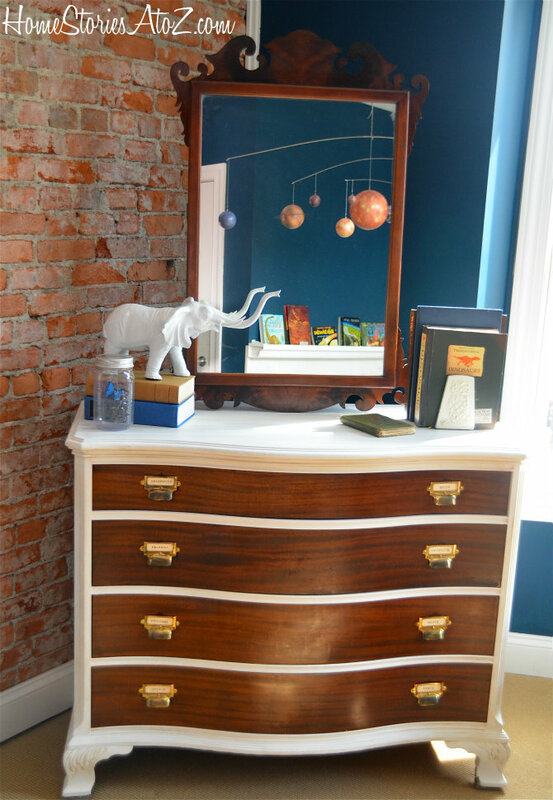 I especially love the dresser! Love that you chose to leave the drawers and paint just the dresser white. Everyone paints everything white…which I totally love!! 🙂 And I have had my white paint out lots lately, but I love this twist!! I also love the great big letters on the wall!! 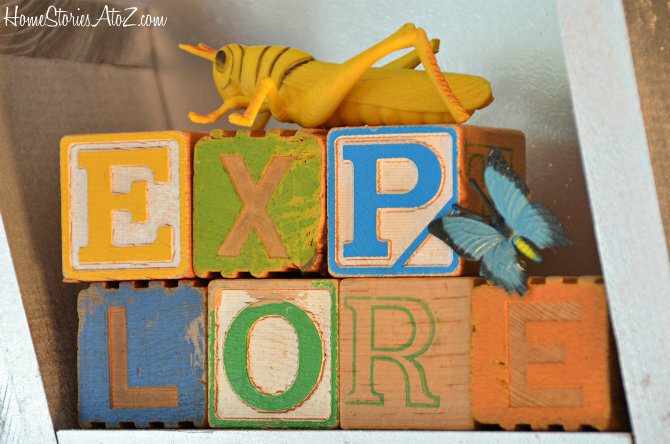 I will be checking out your blog lots to see what you are up to!! (visiting via FunkyJunkInteriors on Pinterest) LOVE this! All girls here (3) at WhatAmberLoves.com , but I’m quite inspired by what you’ve done for your boys!! LOVE the gutter shelving at their level!! 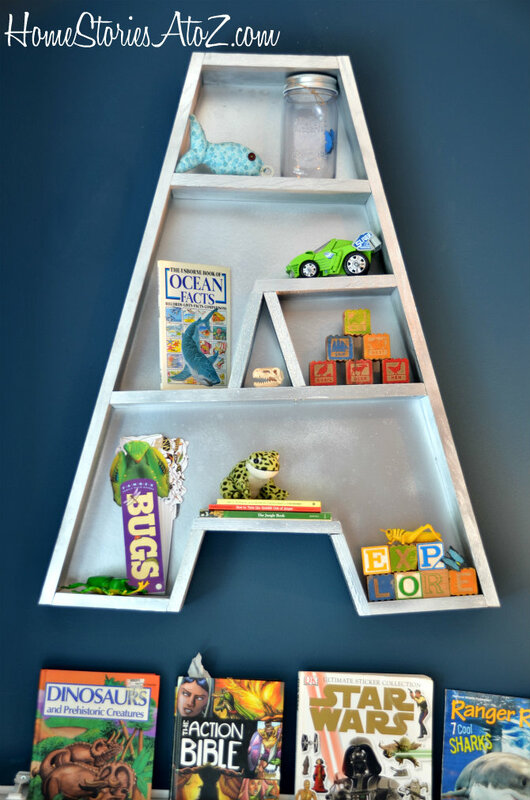 The letter shelves… BRILLIANT!!! LOVE THEM!!! What a wonderful space for your sons! Bright and happy! How blessed they are to have such a beautiful room and a mother that took the time and effort to create it for them! Perfection! love, love, love…I’m going to have to pin this. So many awesome ideas! Beth, this room turned out beautifully!!! LOVE every last detail!!! Great job! Absolutely stunning! And I love the shots with the boys! Brings so much life to the room! I imagine they just love it! Thank you Pam! I do like hanging out in there much more now :). What a great room for two little guys! I love the color scheme which can totally grow with them for years to come. 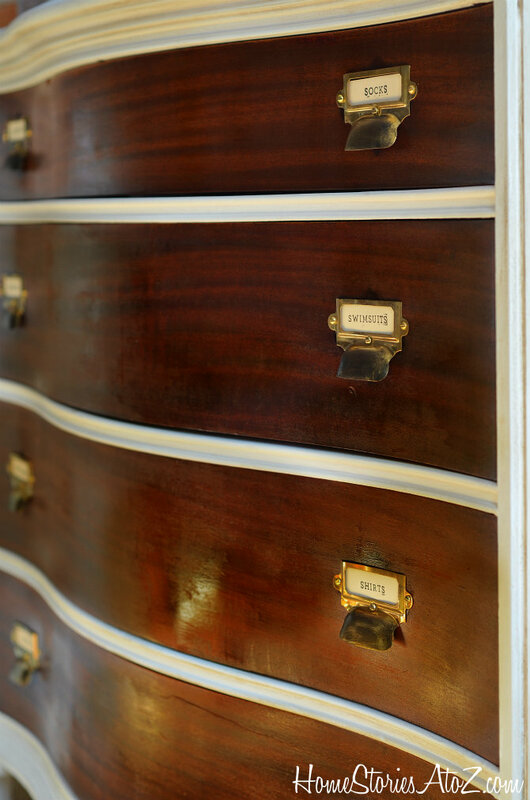 My favorite element are the two-tone dressers – they are gorgeous! Aunt Chris is always welcome! 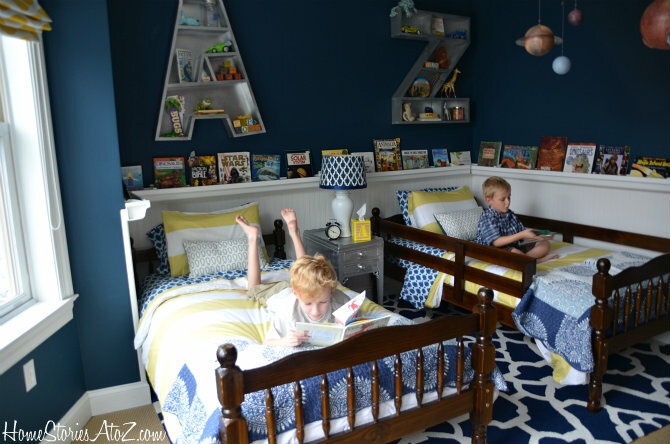 Beth, I loved the first version and I love this one too – the navy, yellow and white color scheme is so fresh and I’m sure your boy adore their room!! Thank you! They love it :). 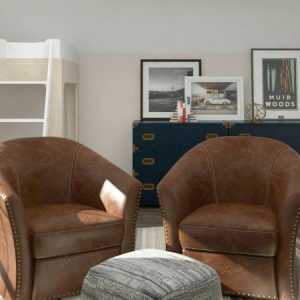 It was a challenge to incorporate all of their “design plan” ideas into the room, but I think we came up with a space that everyone is happy with! Super great boy space! Great work! I LOVE those sailboats over the dresser!! Thanks Jennifer! I like that wall too :). Amazing room Beth! I love that you decorated it with your boys in mind and with items that your boys love and use. I remember when you posted the ‘before’ room in 2009, I can’t believe it’s already been 3 years! such a great room & color scheme, beth! it’s perfect! Thanks Kellie and thanks so much for the Pin! Good to see you stop by Kathy! We’re great :). Love everything about it! 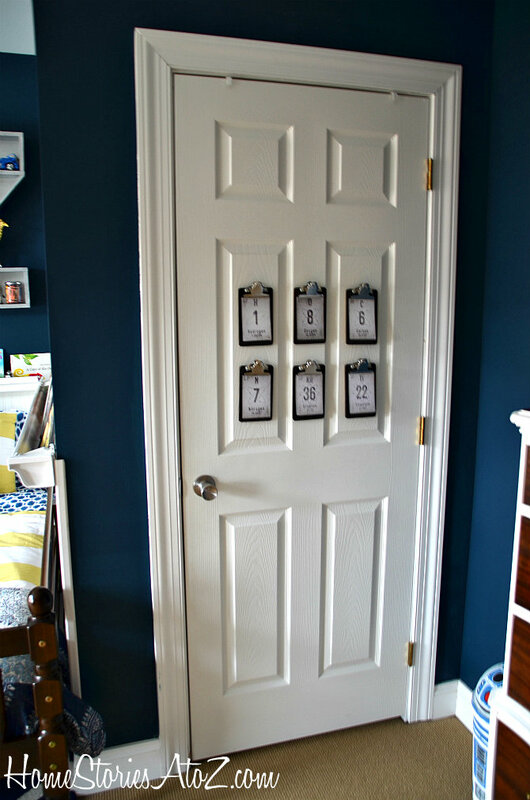 Great job, and perfect inspiration for when I convert my little guys’ room into a big kids’ room!